Lexi is in love with a house, Hollingsworth House. It's a beautiful old mansion that needs a little bit of care. Lexi's husband Dylan doesn't want to move into such a big house. He has other plans for his future. Only Lexi can't forget the place. She decides to take a look and finds an old diary written by Allie, an Australian nurse who stayed in Europe after the First World War. Lexi reads about the love of Allie's life and that brings her comfort when she doesn't know which love she should choose any longer, her husband who doesn't have enough time for her or the house she so desperately wants? 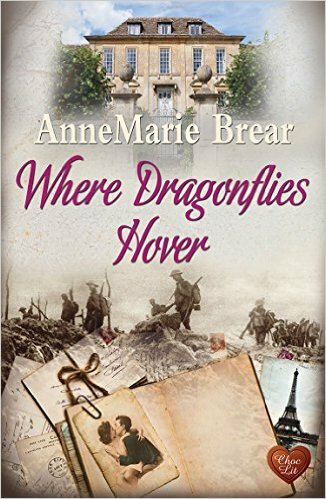 Where Dragonflies Hover is a story about two interesting women. Lexi wants to live in Hollingsworth House. She feels like she belongs there. She's also curious to find out more about Allie. She's fascinated by the diary and it also offers her support. I liked that idea very much. Allie is a strong woman who fights for what she wants. The women have in common that they're willing to go through great lengths to achieve what they have in mind. Their determination is fabulous and it's what I liked best about them. They're interesting and it was nice to find out more about their lives. Where Dragonflies Hover is a quick and easy read. It's a wonderful and entertaining story with likable main characters. I enjoyed reading this book very much. I loved reading about both the past and the present and couldn't wait to find out what would happen next in the lives of the two women. 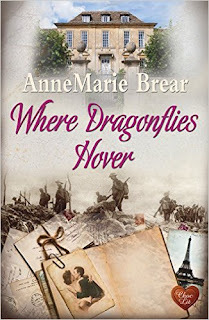 I think AnneMarie Brear has written an enjoyable read about love, war and a very special house. This would be perfect for my sister. She loves old houses, and loves to read. Sounds like I'd enjoy this!